Destruction of the mangrove forests on the Western Sumatra coast has eroded the natural barriers protecting coastal eco-systems and communities from storm surges and tsunamis. By demonstrating the effectiveness of a community-owned and managed mangrove rehabilitation process, the community disaster management task force of Sungai Pisang village in rural Padang influenced government agencies to change their rehabilitation strategy. This established the community’s credibility, opening opportunities for dialogue with local government and enabling the community Task Force to effectively use decentralized planning mechanisms to rehabilitate a main access road. Encouraged by their success, the community is working to persuade the local government to include community analysis of vulnerabilities and priorities for action into the annual local plan and budget. YAKKUM Emergency Unit (YEU) formed in 2001 as an NGO to organize effective community response to natural disasters in Indonesia. In addition to its work on large scale relief and recovery projects after major disasters, YEU now has more than a decade of experience with large scale disaster risk and recovery, including after the Aceh Nias Earthquake and Tsunami (2004), Java Earthquake (2006), Java Floods (2007), Mentawai Tsunami (2010), Manokwari Floods (2010), and the Mount Merapi eruption (2010). YEU has also been integrating disaster risk management into post-disaster recovery and reconstruction, helping communities develop and implement disaster management plans and facilitate community-government partnership initiatives in Aceh, Nias, Mentawai, Central-Java, Flores, Moluccas, Sumatra and West Papua. YEU also supports JAR, a countrywide network of more than 200 community-based organizations which focus on disaster management. The community initiative and partnership discussed here is part of YAKKUM Emergency Unit’s “Sustainable Disaster Risk Reduction and Mangrove Resource Management in West Sumatra Indonesia” Program, promoting coastal resource management to ensure disaster risk reduction and climate change adaptation are integrated into governmental development programs at the district and village levels. Sungai Pisang village, located in Bungus sub-district of Padang municipality in West Sumatra, faces the Indian Ocean. Community livelihoods depend primarily on fishing, farming, cattle rearing and trading. Cutting trees for fuel has destroyed the dense mangrove forest and the coastal ecology, resulting in depleted marine life, seawater intrusion and coastal erosion. Storms and ﬂoods have left village farms and homes severely damaged, forcing many families to relocate. Through a community vulnerability and capacity mapping process facilitated by YEU in 2012, the Sungai Pisang Village Disaster Task Force identified growing threats to the security of local communities and resident livelihoods. These threats included increasing coastal erosion, more frequent typhoons, ﬂoods, whirlwinds, landslides and tidal waves, and environmental degradation caused by pollution, illegal logging and sand mining. The Village Disaster Task Force identified several priorities for actions, including mangrove reforestation, rehabilitation of the main access road, increasing access to clean water, improving access to public toilets, and waste management. The government’s cash for work program failed to rehabilitate the mangroves and left the community discouraged and demoralized. YEU mobilized the community to try a new approach, first identifying local mangrove experts in the community. With the Village Disaster Task Force, they conducted a survey to identify three different mangrove species, locations where soil was suitable for planting and techniques to ensure survival of the seedlings. The community experts and YEU organized trainings highlighting the economic and ecological benefits of mangroves, how to select and germinate seeds and manage mangrove nurseries. The Village Disaster Task Force organized a sub-group of 20 women to monitor the growth and survival of the seedlings. This process was very different from the government-led cash-for-work program, involving the community at different stages of planning, planting, nurturing and monitoring the mangroves, whereas the government program simply paid select individuals for planting mangrove seeds. By November 2013, the initiative had a nursery of 12,000 mangrove seedlings. 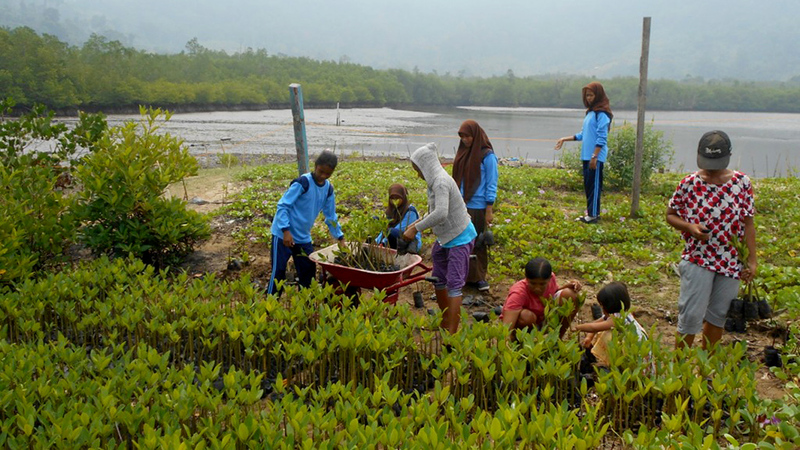 After five months, 7,000 of these seedlings were planted with broad community participation from members of Teluk Kabung Selatan sub-district, Fishery and Marine Office of Padang, students of Andalas University Padang, students of Junior School 37, the village mangrove group, and other local community members. Another 5,000 mangrove seedlings were kept in reserve. Sungai Pisang is the first village in Padang to initiate a community-owned and managed mangrove rehabilitation program, setting a precedent for other villages and regions in the municipality. As a result of the village’s successful incubation of local mangrove nurseries and its advocacy with municipal and provincial Fishery and Marine Departments, it will serve as a seed vendor for municipality-wide mangrove rehabilitation programs. This contributes to village economy as well as long term eco-system protection, as the local mangrove seedlings have a better chance of survival than those purchased from Bali, of which only 40% tend to survive. As a result of this initiative, the Municipal Fishery and Marine Department, together with the Village Disaster Task Force and Andalas University, will collaborate to monitor development of the mangroves. The University will introduce a mangrove rehabilitation program this year. The community will also receive government technical assistance on coral reef and forest conservation. Collaboration on mangrove rehabilitation created opportunities for the community and local government to build a strong relationship and on-going dialogue. After officials saw the newly planted mangroves and held a public meeting, both communities and local governments realized the mutual benefits of dialogue and collaboration. Communities realized that local government could provide valuable information about government programs, resources and technical assistance to advance local development and disaster risk reduction priorities. Local officials, in turn, began to see the value of community knowledge and ownership, which was missing in the government’s individual focused, cash-for-work approach to the mangrove rehabilitation. Despite recognition of community ownership as crucial to sustained success, the government’s transition away from a top-down approach has been slow. One effort to counter this is use of the decentralized participatory planning mechanism known as musrenbang, established by the Indonesian government in 2004. It is an annual consultative process at village, sub-village and district levels providing an opportunity for communities to articulate their needs and participate in local planning and agenda setting. For this process to be truly bottom-up, however, local communities must be well-organized, have the experience and confidence to represent their interests and priorities, and have strong credibility with the local government to inﬂuence local plans and budgets. With the credibility well-established by its successful mangrove rehabilitation project, the Sungai Pisang Village Disaster Task Force effectively utilized musrenbang to improve an access road that is badly damaged and had been identified as a priority in the community risk mapping process. This road is key to safely evacuating communities in the event of emergencies and providing regular access to services and markets. The village local government accepted this as a priority and passed on the request for resources to the sub-district musrenbang, which endorsed the request. Consequently, the municipality has agreed to rehabilitate the road. Through the musrenbang, the Village Disaster Task Force is also urging the local government to integrate the vulnerability and capacity mapping and community DRR plans into the government development plan. This would help to ensure that disaster risks and vulnerabiltiies are recorded and addressed in local development plans. Short term benefits to individuals paid in cash for mangrove planting. Long term benefits to communities as the survival and growth of mangroves enhance community resilience. Benefits extend to demonstrating the importance of community organizing, community ownership and community-led collaboration with other stakeholders in effective natural resource management and resilience building.Benefits included improving relations with government to make the musrenbang(decentralized multi-stakeholder consultation mechanism for village planning) more effective, enabled communities to bring other disaster risk management priorities into the plan. Community role in planting seeds for pay. Community role in surveying, planning, collecting seeds, keeping nurseries, transplanting and monitoring. Location for mangrove planting decided by external organization Local community mangrove experts and members identify land, types of mangrove and the seed varieties required for rehabilitation of mangroves. No post-planting monitoring or maintenance activities to protect mangroves, left plants at risk from cows grazing the leaves and destruction by boat traffic. 20 people from the village disaster management task force of Sungai Pisang formed a monitoring team to check the plants weekly, replace dead ones and made agreements with fishermen to restrict boat traffic so as not to harm the mangrove plants. 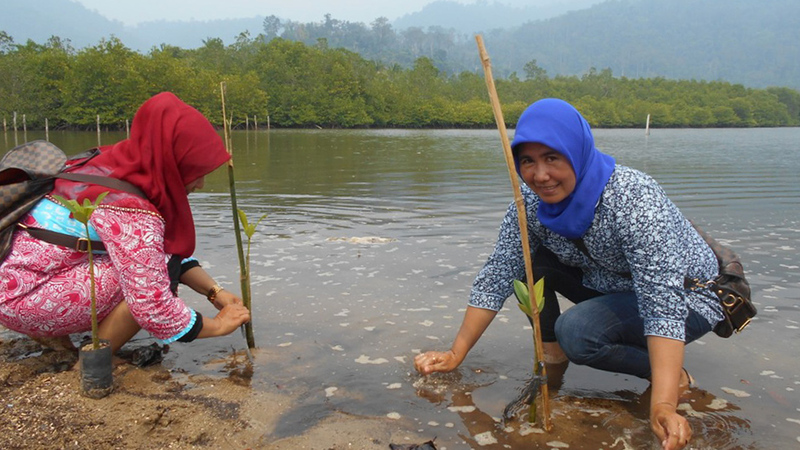 The success of the mangrove rehabilitation project in Sungai Pisang Village demonstrates the strengths of community-led programs and their potential for effective and efficient use of government resources. The village-government partnership rejuvenated an eco-system vital to community resilience and set a strong precedent for changing the government’s top- down approach to rehabilitating mangroves. The community realized additional benefits in learning about the musrenbang decentralized planning process, enabling the village to fund a major road rehabilitation, improving everyday mobility and facilitating evacuation during emergencies. © 2019 Inclusive Community Resilience All Rights Reserved.